Since garage and basement floors are often subjected to major wear and tear, epoxy floor coating can be a cost-effective way to protect them. Epoxy floor coatings are formulated to dry harder and be more resistant to damage than other kinds of floor paint. As a matter of fact, epoxy can increase the hardness and durability of your concrete floors by up to 10%. If you’re looking for epoxy floor contractors in the Colonie area, call Keith D. Becker Painting Contractor. We have extensive experience in the proper application of epoxy floor coatings and would be happy to provide you with a free estimate. Whether you’re interested in having your garage floor covered with regular paint or an epoxy coating, we’re here to meet all your requirements. With more than 22 years of experience in the residential and commercial painting business, our team of skilled craftsmen is highly qualified to handle all your painting projects. By having us professionally apply this specialty paint product to your floors, you’ll benefit from the great looks and extreme durability that epoxy coatings for concrete floors have to offer. If you’d like more information, don’t hesitate to call or e-mail us today. Concrete is usually the ideal flooring material in basements, but it does have a tendency to crack, chip, and stain over time. Properly applying an epoxy basement floor coating can be an effective way to protect your basement floors and slow down that deterioration. At Keith D. Becker Painting Contractor, our professionals have been working with epoxy paints for decades, so we’re familiar with the most effective methods of prepping your floors, applying the paint, and allowing for sufficient drying time. If you’re ready for an epoxy basement floor coating, we’re here to take care of you! 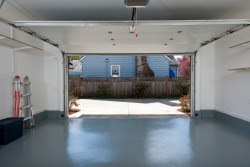 Garage floors get pretty corroded over the years from exposure to things like rock salt, motor oil, and gasoline. Heavy vehicles, lawn mowers, and snow blowers being driven in and out don’t help the condition of your concrete floors much either. But there’s good news: A professionally applied epoxy garage floor coating from Keith D. Becker Painting Contractor is an effective way to reduce the relentless wear and tear on your garage floors. Beginning with a thorough power washing of the surface, we’ll apply a protective layer of epoxy garage floor coating that’s warrantied for a full year. Contact us for a free cost estimate and to learn more about coating your basement or garage floor with this durable material. It dries with a glossy finish, but we can add flakes to the epoxy coating if you’d prefer. Offer customized options for your epoxy flooring, Keith D. Becker Painting Contractor is the solution you’ve been looking for when you want durable, attractive floor finishes for your home, garage, or workplace.